I remember sitting in my dusty old college house just a couple months before graduation, thinking how several aspects of my life had become stagnant. Each day felt like I was just going through the motions, not really attentive to things going on around me. My thoughts would wonder away from the quiet hills of Appalachia and manifest visions of life in the Rockies. I imagined the feeling of pure freedom in nature; experiencing the rush of raging rivers, living peacefully with majestic mountains as the backdrop of my primitive tent home, and being able to satisfy my craving for adventure… whatever that actually meant to me at the time. My biggest fear in life then was falling into a mindless routine, working a job that meant nothing to me and just getting by; being alive but not really LIVING. I knew I wanted to be involved with adventure recreation, and I had a deep connection to kayaking. Furthermore, I had also drawn a strong desire to be an educator from my time spent in academia. Ideally, I wanted a career path that would allow me to work outdoors, share my passion for nature with others, and also be filled with excitement every day. Of course all of this sounds great, but my real dilemma was how do I actually make this happen? For the conclusion of my degree, I needed to take part in an internship with an outdoor recreation company. This internship was a ten week commitment to be focused on actual hands on involvement with what was supposed to be my potential career path. I loved teaching people about the beauty and excitement of outdoor recreation, but wasn’t sure where to start. At first there seemed to be countless options. However, none of them seemed to spark a true desire to be involved. Then, I stumbled across the Rocky Mountain Outdoor Center… “Hmm, this seems pretty cool” I remember thinking. After talking with Brandon over the phone, it was the first time throughout my searching that I felt that spark. That conversation with Brandon was a huge turning point for me. Little did know, I had stepped right on an absolute perfect opportunity that would end up being the greatest experience of my life thus far. There were many aspects of RMOC that made it a very attractive opportunity for me. First off, their programs were unique compared to any other company I had looked into. They had a strong focus on kayak instruction, yet were an extremely well rounded company offering adventures in rock climbing, mountain biking, rafting, and stand-up paddle boarding. I immediately saw this structure as a way to work closely with kayaking, but also expand my own professional spectrum to other programs and activities. Secondly, the location of RMOC is perhaps one of the most amazing places that I could imagine working and living. For an outdoor enthusiast, you will have trouble finding a place with more opportunities. The landscape is remarkably dichotomized into two opposing biomes. To the west stand the profound peaks and valleys of the Sawatch Range, with a majority of those mountains reaching over 14,000 feet. On the contrary, due east holds the rugged and rocky desert like terrain displaying granite plumes and canyons. No matter what you’re into, you can find it in the Arkansas River valley. Finally, another deciding factor for choosing RMOC lies in the staff and management. Upon arrival at RMOC, I was instantly treated as a member of the crew with a friendly welcoming. I was definitely a little apprehensive at first to jump into involvement because I felt so new and inexperienced. However, my fellow co-workers encouraged me to be a part of the RMOC family and my uneasiness quickly disappeared. Before I knew it, my co-workers had promptly transformed into great friends. Not only did they welcome me, but everyone was very helpful with assisting me in becoming familiar with daily operations. The more experienced staff took me under their guidance and became my mentors. I was able to learn from their great examples, and am extremely grateful for their leadership. 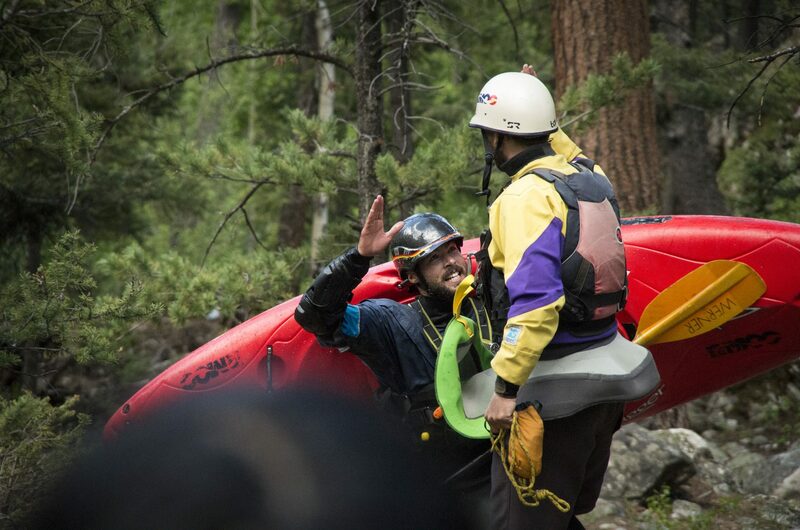 With their assistance, I was quickly learning and growing as a leader, kayaker, teacher, and member of the RMOC team. Before the start of my internship, I had created a list of goals to help guide me through this experience and insure that my internship was as meaningful as possible, in terms of professional development. My goals focused on the direct instruction and leadership of outdoor programs, as well as the administrative and business aspects of the outdoor industry. I wanted to learn about the operations of the company both inside and out. This mix was very beneficial in exposing me to how our recreation programs are created, marketed, and implemented. Seeing the two sides of the business gave me important insight into how this type of company was run and managed. On the business side, I had first-hand experience organizing logistics, creating schedules, taking reservations, and learning the complexity of regulations and permitting. Furthermore, I was given the task of creating and writing up a program for the local youth paddle club. As an instructor, I was managing gear, creating lessons to best fit the clients, actually instructing clients, and safely executing trips on fast moving sections of river. By the last day of my internship, I had encountered and completed all of my goals. I was able to be involved with everything that I had desired, plus several important components Brandon brought to my attention that I had overlooked. As my journey has now transitioned to employment, I can easily say that I made the best decision choosing RMOC for my internship. This experience has not only been incredibly influential, but also extremely fun. Each day is unique and the work conditions are often dynamic. This creates challenges but also continual excitement. Working with nature requires one to be adaptive and prepared. I certainly became more comfortable managing and dealing with spontaneous situations, which was all part of my development. Of course, my leisure time outside of work was unbelievably fulfilling in its own right. I was able to paddle incredible rivers and rapids, climb stunning rock formations, and witness the diverse and limitless beauty of the area. So if this sounds appealing to you, give Brandon a call and find out how you can choose your next life adventure with the Rocky Mountain Outdoor Center!